Diamond was conceived to satisfy the need for heating solutions that accompany the conceptual evolution and differentiation of modern spaces. Its value lies in the geometric shape that resembles diamonds, in the colors and heating emission capacity. ... V is a vertical work of crafted wonder, available in a range of colours and finishes, including the striking brushed stainless steel. ... shapes hide sophisticated technology, designed to store bathrobes and towels so they always warm and dry. Aluminium and stainless steel make this the perfect solution, even for the dampest rooms. A stainless steel radiator has an attractive, easy to maintain finish and higher heat conductivity than steel models with an applied finish. There are wall-mounted and freestanding versions, some with an adjustable thermostat. On ArchiExpo, these items are arranged by properties such as function or heat source. 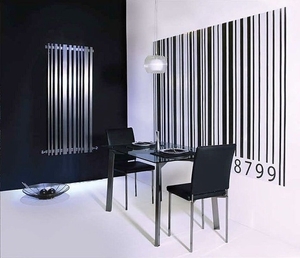 These radiators are found in commercial, public and residential environments. Standard rectangular hot-water models are often used in multiples. There are also original and contemporary designs which can complement different decorative schemes. Consider where the radiator will be used, how the temperature will be regulated, how energy efficient it is and whether it will use hot water, electricity or solar power. Determine the need for extra features, such as an adjustable thermostat, and and suitability for towel drying or other functions. Tactile temperature may need to be limited to prevent burning, e.g. in public facilities.